Doumeki, Watanuki, and Mokona are eating and talking when Maru and Moro announce that Kohane-chan has arrived. She brings a present of beef shigureni from the old fortune teller for them to eat. With Doumeki and Mokona wanting sake and snacks, Watanuki has Maru and Moro clean up the dishes while Kohane-chan and Watanuki walk to the kitchen. Watanuki complements Kohane-chan on her school uniform, even though he’s done so before. Opening the cloth wrapping the container of food, Watanuki sees a letter from the old fortune teller, informing him that he’ll have a customer tomorrow. 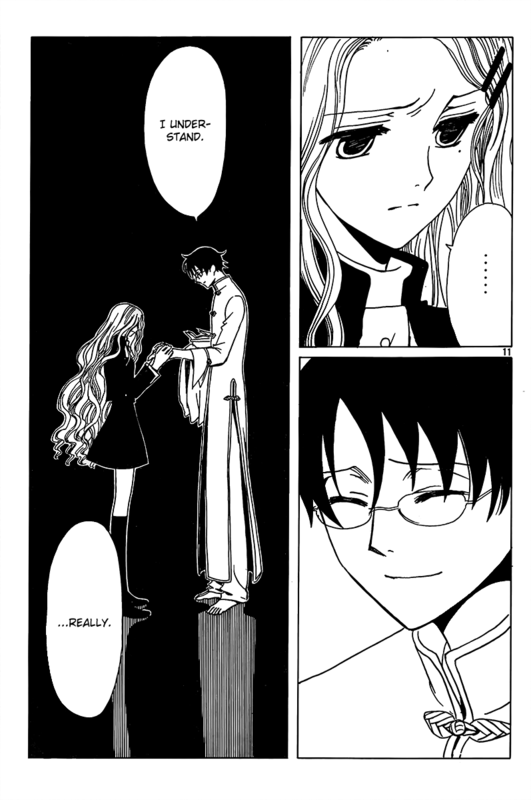 Kohane-chan is worried about this, so Watanuki assures her it is not like it was at the beginning. Even though she understands this, she hates to see Watanuki hurt in body or spirit. That evening on the engawa, Watanuki and Doumeki talk over a bottle of sake. Doumeki mentions the fact that Watanuki will be getting a customer, having heard it from the worried Kohane-chan. Watanuki comments on his powerlessness and that while he doesn’t age, he can still take injury and really can’t use a doctor, who would have to make a house call. Nevertheless, Watanuki will see customers and grant wishes as he continues to wait for Yuuko-san. Thoughts/Review: This ended up being an interesting chapter for me. For starters, we got to see an older Kohane-chan, who’s about to graduate from junior high school. It is interesting that she’s still living with the fortune teller, so apparently things still aren’t right with her mother. I’m glad to see that she too kept close to Watanuki. Her worrying about Watanuki getting a customer combined with Watanuki’s remarks to Doumeki on the subject makes me think that when Watanuki grants a wish to someone, he sacrifices a part of himself somehow. I would say that the wish-granting payment system is still in place, but if Watanuki is taking injury somehow from granting wishes, it seems to me that he’s paying the price with his body. Considering the type of person Watanuki is, this wouldn’t surprise me. I suppose we’ll find out next chapter. I’m hoping Zashiki-Warashi and Himawari-chan make appearances before the manga concludes. So, nothing to do but wait for the next chapter as we get closer to the end. She has in the new manga, but in an unknown way.